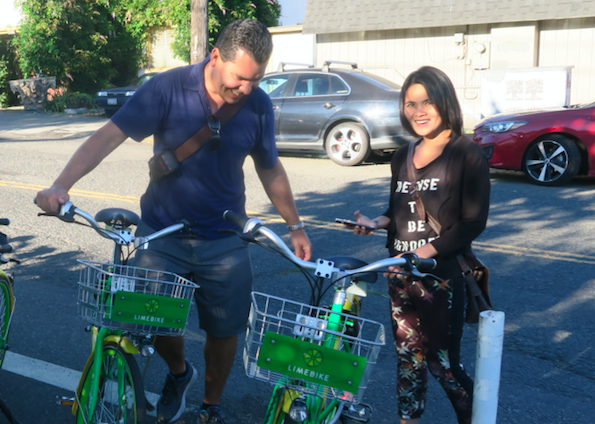 I caught up with Leila and Fernando just as they were unlocking two LimeBikes. They’d walked to Fremont from the condo they were renting in Belltown and were excited to give bike share a try for the first time, going back via the Westlake Trail. Since there are no easy directions from Fremont to the trail — or signs to follow leading to the new trail — I guided them to the trail entrance and learned a little more about this couple. They had moved from Hawaii in June for jobs in South Lake Union. Leila was a bit worried about riding a bike in traffic, even in the wide bike lanes along North 34th Street. She thought the green bike box to turn onto the Fremont Bridge felt a bit risky as well. Fernando biked slowly behind Leila and was grateful for being guided to the Westlake Trail. Fremont is filled with new Spin and LimeBikes. In fact, I saw a two people riding together, one on Lime and one on Spin, on my way back home. Both bike shares rent for $1 for 30 minutes. They feel similar in comfort and user interface, though Lime has eight gears (for climbing hills), while Spin has just three. 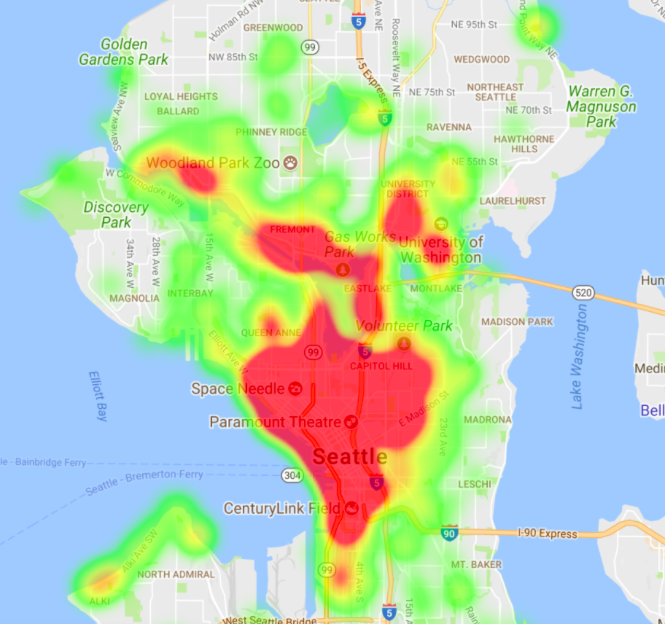 People in Seattle are eagerly embracing station-free bike share and the new bike share systems are being used in record numbers. Operated by smart phones, the Lime and Spin systems are proving they can be an important part of our public transit network. Because the bikes can be ridden almost anywhere in Seattle. where they end up paints an intriguing portrait of the places tech-savvy folks want to go by bike, and where we need safe, accessible, connected bike routes.